Staying at Naracoorte for a three week holiday earlier this year, I took the opportunity to go and visit my cousin, Graham, who now runs the farm at which I spent many of my childhood holidays. Not much has changed, except the pine trees out front are taller. Out the back, over the hill, with large gums standing looking on silently from the wheat-coloured paddocks, I drive up to the shearing shed. It has been raining all morning, but it is a January kind of warm and muggy. I hear the radio first, AC/DC Highway to Hell, then smell the sheep and climb the aging ladder up to the nerve centre. It is 8:30am and they’ve already been at it for an hour. The thick oily-urea smell of sheep gets in my nostrils and before I know it I’m wiping my nose with the irritation. Two shearers, Hayden and Corey, repleat with double-layered dungarees and quick-grip moccasins are bent nearly double (partially supported by a padded and sprung shackle which hangs from above) holding the sometimes un-cooperative sheep still, while they remove last year’s coat. The shears, no longer the clicking variety, make a mechanised shrill buzzing sound, glide through the wool, separating it instantly from the sheep, leaving a discarded pile on the floorboards. The number of fleeces is clocked on a small silver counter and they earn $2.94 each one (double for a ram). To the uninitiated, it is a pile of wool. To the roustabout, Mykia, jetting around the floor in her tennis socks, the pile contains many distinct possibilities. The rectangular section of belly wool is separated, the cruddy bits discarded and a sample is taken (from a spot originally found close to the ribs of the sheep). Then with an action akin to collecting up bedsheets you’re taking to the wash, it is swept up into a big heap to be weighed. “6.4!” Kilograms that is, the weight of one fleece. The figures are being carefully recorded and matched with numbered ear tags to assist with selecting the strongest potential breeders for the following year. This pile of wool is then flung across the wool table – a waist high collection of spanned metal rods that let the dags drop through to be efficiently swept up with a flat plastic-swivel-headed broom, known as a sweep. It is like magic to see how the fleece expands and contracts like a rubberband and when it lands, moving as one entity. Now the edges, the parts that come from the legs and tail, get separated and thrown over onto separate piles, to keep the quality of the wool high. 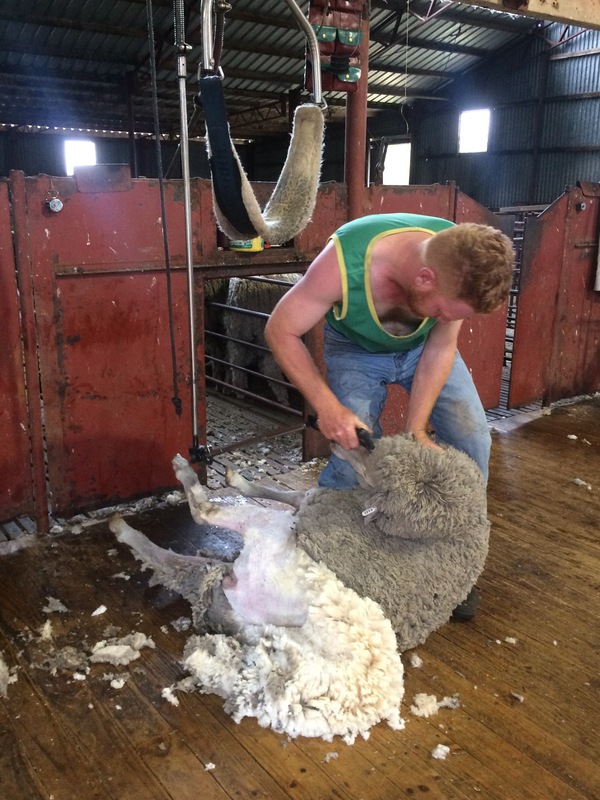 The wool classer, Ron, similarly gathers the fleece into a loose pile to pluck a strand which he then flicks – the closest thing to clicks you hear in a shearing shed these days. If it fails the test, the wool is classed as tender, and the fleece joins a small pile (around 3% in this shed) of wool which is not so strong – where the sheep may have suffered stress during the year. Then the pile of wool joins the 180-204 kilograms of other fleeces in the baling machine, where it gets compressed under pressure. Behind the red metal swing gates, Matthew, pen-er-upperer (I think that’s a word) and his red dog, Rusty, continue to herd the flock closer to their disrobement. The rams wait patiently in separate corrales, they will get their turn at the end. Graham takes a turn at shearing, but assures me his skill is in taking care of the sheep rather than getting the wool off. To my untrained eyes, he looks enough like a pro. Graham’s is a fairly small concern, however Ron, a veteran in the district, speaks highly of it’s quality. He’ll get a good price for the wool at sale, but not so much this year for the quality, but more due to the high market value; such is the seemingly arbitrary nature of the commodity market. Over smoko, the shearing shed gossip of shearers coming and going, travel stories and local personalities continue while Lizzy the kelpie surveys the shed. I joked later that I only managed to shear 60 sheep, but actually I am in awe of the physical endurance required to do this work. Click go the shears, seems such an upbeat ditty to describe such a back-breaking vocation.